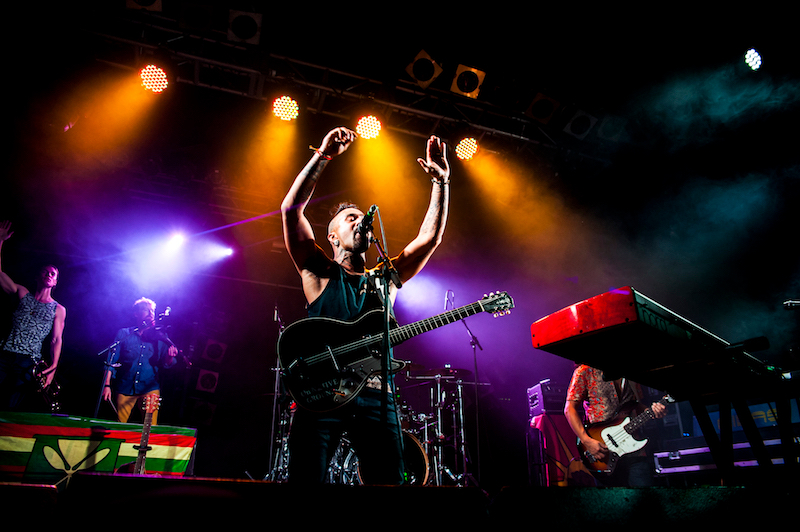 Thursday 21st January - After a successful debut in London last summer frontman Nahko Bear and his incredible band are back to give its audience one night of amazing music. Definitely quickly just need to mention the support act Kim Churchill, who hails from Australia and brings with him a vibe of folk, rock and blues. It was an impressive set and a great compliment to the main act. With a rather packed venue, it was clear to see that Nahko Bear and Medicine for the People have a solid UK following, and before the set kicked off Bear was treated to an early 'Happy Birthday', showing more signs of a dedicated fan base. With a multicultural background Bear (born in Oregon with a mix of Apache, Puerto Rican and Filipino heritage) music provides for an eclectic mix of musical taste and sound. With more than a few songs bringing visions of you lying on a beach with a cocktail in hand (no complaints there). It makes a refreshing change to listen to good music with a message. Bear has a unique gift of telling stories with his songs, it becomes enchanting listening to him live, you can't help but be absorbed by the presence of him, the band and the music. Performing a favourite of the audience; and their biggest hit to date, Aloha Ke Akua. Which speaks of bringing cultures together positively, very catchy and it captures the essence of this band and what they are all about. The band continued to show off their impressive collections of songs throughout the night, including some new material (which has been a long time coming, three years since their last album with promise of a new album in April). Wash It Away featured in the set list, with Bear's beautiful vocals it highlights again the need for community and motivation. The band also treated the audience to a few covers, including 'Hello', 'Can't Feel My Face' and quite a few others. It also gave the drummer Justin Chittams, a chance to show off some soulful and pitch perfect vocals. The lively atmosphere went in to overload with Bear and the band performing another medley of popular hits (from Warrior People to No Diggity), and then being treated to an incredible solo from flugelhorn player Max Ribner, performing Thrift Shop and Stand Up. The liveliness didn't stop there with the band then moving on to Black As Night, with everyone singing and jumping in harmony. With a night of sublime music, beautiful lyrics, good vibes and huge personality, I'm sure that Nahko Bear and Medicine for the People popularity will continue to grow. And personally I hope it does, with a strong powerful message of love and community I think everyone needs to hear it.